Washington, D.C. - The U.S. withdrew from the UN Human Rights Council last month because of the group’s longstanding bias against Israel - evident in the number of resolutions that target the nation. 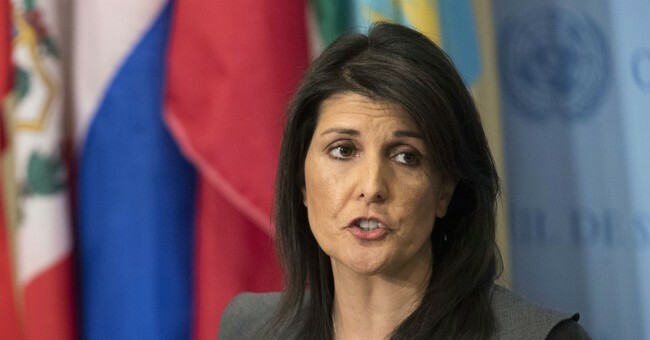 U.S. ambassador to the UN Nikki Haley explained why the U.S. had no issues saying sayonara during a speech at the Heritage Foundation Wednesday. The UN "was founded for a noble purpose," Haley explained. It was intended to promote freedom, defend human rights around the world and encourage the self-determination of people. Unfortunately, that goal has long been forgotten. The UNHRC is now focused “relentlessly” on Israel while it has “ignored” the misery in Venezuela, Cuba, Zimbabwe, and China. The organization now “allows dictators to control the agenda.” Resolutions, meanwhile, “get watered down until they are meaningless.” It’s all done in the name of building consensus. Michael Kozak, Senior Advisor and Senior Bureau Official at the State Department, recalled how members have failed to use their power to block votes in order to be fair to all the continents represented. “It’s how you get your friends to start standing up,” Kozak said. Haley also spent a few moments speaking out against the NGOs who “should’ve known better.” Organizations like Amnesty International and Human Right Watch agreed to keep violators off the council, but they came out against U.S. reforms, and even told other countries to vote against them. They were unwilling to change the status quo, she mused, because they had cozy relationships with the UN bureaucracy. Just because the U.S. has left the UNHRC does not mean it has forfeited its human rights agenda. Quite the contrary. Free of the council’s shackles, the U.S. will continue to promote a hands on agenda. Consider Trump’s action in Syria, Kozak offered. After the world learned Bashar al-Assad had again been privy to the chemical attacks on his own people, the U.S. responded with a set of powerful airstrikes. Other punitive measures taken by the U.S. include placing Visa sanctions on Cambodia, and a host of other sanctions under the Religious Freedom Act. Pakistan was placed on the religious freedom watch list for first time. During her remarks, Haley recalled the time a friendly nation begged the U.S. to remain in the council, telling the ambassador that the U.S. provided the council’s “last shred of credibility.” That was all she needed to hear. “We need to associate ourselves with people who share our values,” said former Ambassador Kevin Edward Moley, who now serves as the Assistant Secretary of State for International Organization Affairs. But the U.S. won’t stop trying to fix the council’s faults or charting its own human rights course.